The implementation of a fairer and more dignified conditions for women working in our company led us to be the first company in Costa Rica to be certified with the Mark of Gender Equality. With this measure, Travel Excellence promotes the entry of females to the labour market and the improvement of the quality of their employment and their work conditions. "Statistics and comparative experiences say that hiring women is only a decision to win, because we generate new values and understand the many consumers in the great emerging market of economies. Claiming that a new ethic of equality where we are better off means not only well-being within the company, but also in families. It is a bet to believe in them", said Alejandra Mora, Minister of the Status of Women. The company underwent a process of implementing the necessary measures to adapt its structure and organizational culture, in order to ensure a set of more fair and dignified conditions for the collaborators. "Since 2011 we have had this strategic challenge to strengthen good practices and to make adjustments for a more comprehensive gender approach. It is a great pride for Travel Excellence to be the first company recognized under this standard and for its commitment to improving the conditions of work”, said José Alex López, our Quality and CSR Coordinator during the event of certification. The multiparty standardization committee gathered by Institute of Technical Standards of Costa Rica (Inteco) and lead by the Women’s National Institute (INAMU) reviewed the requirements in 2013 for a public or private organization to be certified, with the support of the United Nations Development Program (PNUD). This standard promotes the minimization of gender gaps and the increase in competitiveness in terms of gender equality. In July 2016 the company signed, along with 45 ethical companies, the commitment to certify themselves with the Standard Management System for Gender Equality in the Workplace (SIGIG, for its acronym in Spanish), which regulates the national standard INTE 38-01-01. To achieve this certification, a corporate diagnosis is required in order to identify the gender gaps that exist in the organization, from which the subsequent programs are established with clear objectives and goals to be achieved. These gender gaps are either currently existing in the company or potential differences which must be controlled to prevent them from becoming actual gaps. “There is no perfect organization in terms of gender-based approach, since none of them can fully control staff’s socialization and preconceived ideas. However, we have demonstrated continuous and effective efforts to minimize gender gaps and improve the organizational culture”, stated Mr. López. For this, the company should improve its human resources management system with a gender perspective and ensure that their recruitment and promotion criteria are equitable for all genders. Performance evaluation, competences definition and family leaves are also procedures to be examined. Besides, the company must establish clear and fair procedures for dealing with cases of sexual harassment and workplace harassment as well as have a series of measures for work-family conciliation. The same protocols are applied for mobbing (workplace harassment). All the measures ensure the wellbeing of all the collaborators of the company, in terms of personal life, health, equality, and safe conditions at job. "In this challenge, we had great learning on the matter with the assistance of specialists from the consulting firm RBA, who supported us with an objective gender perspective, realistic and oriented to add us value as an organization," as López said during the ceremony. Finally, the company underwent a rigorous audit process by the Compliance Evaluation Directorate of Inteco, which is also the only entity currently accredited to grant certification. Then, how does a company benefit from this label? According to Cynthia Castro, the gender equality specialist consultant for Travel Excellence and Social Development Director from Reinventing Business for All (RBA), enterprises gain many benefits when applying gender equality policies. "Gender equality must be a key issue in a business competitiveness strategy, since not having gender equality in decision-making positions affects investment returns, productivity and business strategy," Castro said. Gender equality is a fundamental human right and is one of the UN’s Sustainable Development Goals (ODS). Opportunities for women are a means to move towards the achievement of other goals of the 2030 Agenda for Sustainable Development. 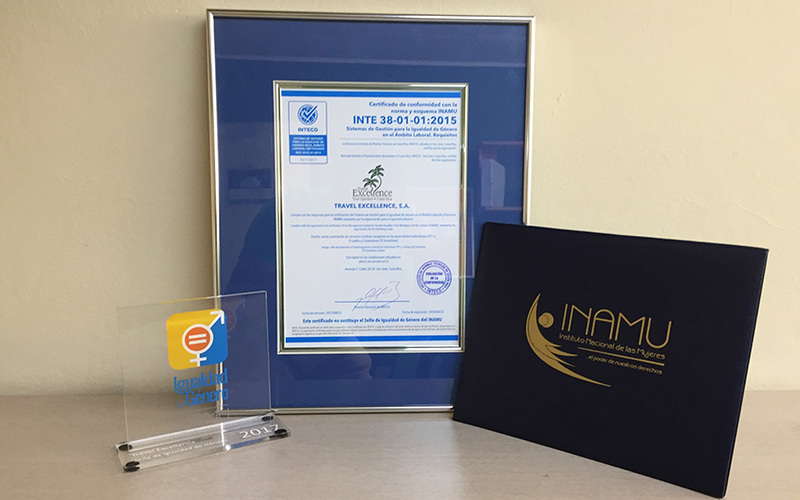 According to the INAMU, the certified companies obtain as benefits a greater performance and also a greater commitment of the staff; as well as reducing absenteeism, a fairer and more equitable working environment that maximizes the capabilities of all staff, and an improved public image by exercising leadership in the promotion of corporate responsibility, among others. Castro explains that inequality is a bad business, "according to a study by McKinsey, if Latin America manages to close its gender gaps at the current level of Chile’s gaps, we could increase 14% of the Gross Domestic Product (GDP) by 2025. And if, as a region, we achieve absolute equality of participation and conditions between men and women in the productive force, we would achieve a 34% increase in GDP". Endorsed by this certification and the Government mark, we can assure we are a company committed to gender equality, discouraging any misconduct associated to sexual harassment or gender-based discrimination. The management system is meant to continually improve our results to eliminate any potential or actual gender gap in our work and service environment. Costa Rica travel: More people coming for sports tourism!